Dr. Ashwin Mehta is one of the best Cardiologist in Mumbai, with more than 38-year's experience behind him and is Director of Cardiology at Jaslok Hospital & Research Centre, Mumbai. During his academic career and medical practice, he has received innumerable awards and honors. Dr. Mehta is a recipient of the prestigious Padmashree National Award, presented to him in 2004. He has also been very active on the academic front throughout his career. Dr. Mehta has taught hundreds of undergraduate, postgraduate and super specialty medical students. Currently at the DNB Board, and earlier for over 25 years as Honorable Professor of Cardiology at the University of Mumbai and then at Lokmanya Tilak Municipal Medical College, Sion, Mumbai, Dr. A.B. Mehta has been an invited faculty at events in France, China, Japan, Italy, USA, Sri Lanka, and Singapore, for demonstrating techniques of Angioplasty. Dr. A.B. Mehta has served as Examiner for the DM Cardiology examination at Pune, New Delhi, Ahmedabad, Kolkata, and other cities in India. 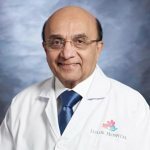 Ashwin Mehta is recognized for his pioneering work in India in Angiography and Cardiac Catheterisation in newborn babies and was also the first to introduce His Bundle Electrography in India and Primary Angioplasty in Acute Myocardial Infarction with the first systemic trial. Dr. Mehta has performed/supervised more than 10,000 Angioplasties and over 50,000 Angiographies. Dr. Ashwin Mehta is much-published, and he has organized numerous teaching seminars, symposia, conferences, and meetings, where he has also actively participated in the presentations and deliberations. Dr. Ashwin Mehta is one of the top cardiologist in Mumbai with an experience of more than 38 years. Dr. Ashwin Mehta is a Pioneer in starting Cardiac catheterization and Angiography in newborn babies in India in 1973. Dr. Ashwin Mehta is the first one to start His Bundle Electrography in India in 1973. Dr Ashwin Mehta performed or supervised more than 10,000 Angioplasties. Dr. A.B. Mehta performed or supervised more than 50,000 Angiographies. Dr A.B. Mehta has done pioneering work in Primary Angioplasty in acute myocardial Infarction with first systemic trial in India. Dr. Ashwin Mehta is a cardiologist and has numerous awards to his credit: 1) The CTO – Man of The Year Award (2008), the First of its type, for the Indian Chapter of 2nd Indo European Course on Revascularization (IECR/IEIC), presented at New Delhi on 20th December 2008. 2) Life Time Achievement Award at the 1st IJCTO meet, at Mumbai on 8th June 2013. 3) Golden Contribution Award received at AICT 2012 at New Delhi, on 6th Oct. 2012. 4) Padmashree Award from the Goverment of India in 2004 5) Maharashtra Gaurav Award for the Most Outstanding Contribution in Cardiology, by the Government of Maharashtra in 2004 6) Distinguished Doctor Award Presented by the Indian Medical Association, Mumbai Branch on "Doctor's Day", 1st July 2008. 7) Mahavir Mahatma Award for Oneness and Towards Social Upliftment (Times Foundation, 2006). 2006.